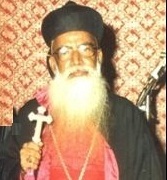 Mor Theophilos Thomas of Blessed memory was the metropolitan of the Outside Kerala diocese of the Jacobite Syrian Orthodox church from 1979 to 1992. 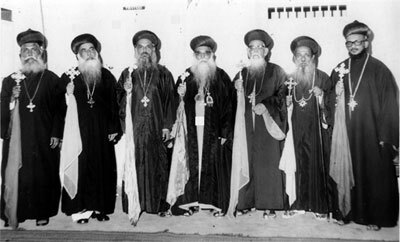 In the 1970's, when the Syriac Church in India experienced a vertical split following the parting away of a sect raising anti-Church slogans, most of the parishes which were built by the combined efforts of faithful from both the factions in outside Kerala diocese were occupied by the rival Malankara Orthodox faction. It was Fr. Thomas Moothedam who gave strong leadership to the Jacobite faithful in the Outside Kerala diocese during that critical period in the history of our church. He gave able leadership to the faithful and took lead in establishing new churches and through his vision and efforts, defeated the ugly designs of rebel group through which they tried to swallow the faithful Syriacs. When the necessity arose to ordain a full time Bishop for the Outside Kerala diocese taking into consideration its growth, the church had no doubts about who that should be. Rev. Thomas Moothedam Ramban, who had taken leadership in establishing most of the churches there, was elected to lead the Outside Kerala Diocese which was in it infancy at that time. He was ordained by name 'Theophilos' by Late Lamented Mor Baselios Paulose-II Catholicos of blessed memory on 19th April, 1979 at St. Simon's Jacobite Syrian Orthodox church, Velloor. Mor Themotheos Yakoub and Mor Ivanios Philipose were also ordained along with him. After leading the Outside Kerala Diocese for 13 years with dedication, His Grace entered his Heavenly abode on January 12th, 1992. It was through Thirumeni's efforts, St. Peter's Jacobite Syrian Orthodox Cathedral, New Delhi - the Eastern Cathedral of His Holiness, which is the pride of Syrian Jacobites in Delhi, was established. Mor Theophilos is entombed in M.S.O.T. seminary Chapel, Mulanthuruthy. May his prayers be our fort.